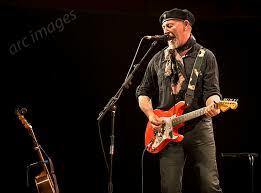 Those of you who’ve taken the time to explore my website will know I make no secret of my admiration for the artist I believe to be the greatest of them all, Richard Thompson. For me, the combination of his immense song writing skills and his virtuoso mastering of both acoustic and electric guitar place Thompson at the very highest echelons of popular music artists. And so, it is always a delight when the opportunity comes along to see Richard play live. Currently out on a UK tour supporting the recently released album 13 Rivers (reviewed here http://tarkablowpigmusic.com/2018/09/album-review-13-rivers-richard-thompson/ ) Thompson, with long term collaborators Micheal Jerome (drums and percussion) and Taras Produniak (bass) has put together a trio of both great power and collaborative subtlety that presents 50 odd years of Richard’s work in a well paced, beautifully flowing and exemplary performed set list that mixes up old Fairport Convention songs, RT crowd pleasers and some new works from the excellent new album. Also featuring Bobby Eichorn supporting the trio on acosutic and electric guitar this band are one at the top of their game, clearly enjoying the experience of performing some wonderful songs and showing off their amazing musicianship. The interplay between the three/four of them gives the impression of the players being a far greater sum of their parts creating the illusion of far more than the instruments they play. The skills of Jerome in drumming simultaneously with both RT’s guitar parts and Taras bass is jaw droppingly amazing. The easy power developed by Produniak’s bass lines drive the band to heights of playing very few bands in the world can reach. And then Thompson’s guitar playing, well what can you say other than here is a guy, nearing, as he alluded in the introduction to an old Fairport song, Tale In Hard Time, his 70th year playing with the youthful vigour and enthusiasm of the 19 year old who wrote those tunes back in 1968. And as for those tunes, well it was if Richard had asked me, personally, what songs I wished to hear. Beautiful acoustic versions of Vincent Black Lightning 1952 and Beeswing, were joined by rocking versions of classics like Wall of Death and the perennial favourite Tear Stained Letter. A sped up and harder edged version of the Fairport anthem Meet On The Ledge slipped into the list alongside some of those brilliant new songs. Thompson is an artist who has created a legendary catalogue of songs over the last 50 years that this band presented fabulously to an Oxford crowd who were fully appreciative of the fare they were treated to. And here is the thing, still, after all these years, you get the impression from Richard, in his typically modest and self effacing way, that he is never that certain he deserves the acclaim he gets. Well, i for one can ensure him, as witnessed last night, he more than deserves all the plaudits and more. This was clever, brilliantly performed and amazing work and an absolute joy to be there to experience.